called Crawford-TEM-Cell or Transverse ElectroMagnetic cell) for E- and H-field probe calibration and immunity testing of components. 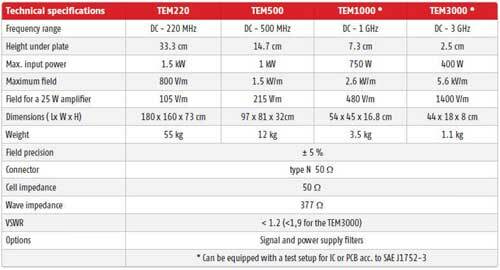 The TEMZ 5233 complies to the requirements of ISO 11452-3, IEEE 1309 and EN 61000-4-20. The TEM – Measuring Cell TEM -2000 permits the measurement of the screening attenuation of electrical conducting plastics, conducting laminated plastics, screening materials and braids. Weight Approx. 40Kg Approx. 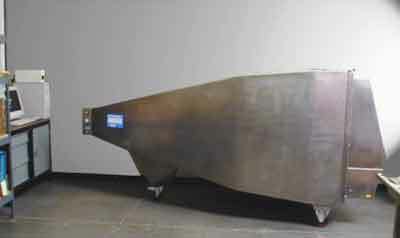 20Kg. Approx. 4.8Kg. Approx. 1.6Kg. * can be equipped with a test set-up for IC or PCB according to SAE J1752-3. These open TEM cells (tri-plate cells) are well suited for immunity testing of small objects according to European (CE) and automotive standards (SAE J1113-25) or for biological experiments. The advantage of these TEM cells is that they are open and it is very easy to control the functions of the equipment under test. 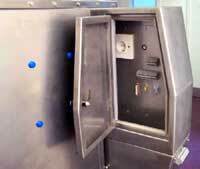 The applications are for instance the immunity testing of watches, pagers, telephones or PCB's. In comparison with other closed TEM cells, the price is low. The field decreases rapidly outside the open TEM cells (approx. 33 dB at 1 meter) and it is therefore possible to use an open TEM cell in ordinary facilities. Another very interesting application is the calibration of field probes because the field inside the TEM cell is known with high precision. TEM cells are the most precise structures for field calibrations. Same RF features as the LaplaCell300/2 below, but with eight times the EUT test volume. EUT Size: 23.64" x 23.64" x 23.64"
Usable EUT Test Volume: 30.7" x 32.3" x 34.2"
This is the view of the rear of an LC600/2. On the left is the filter block access door, on the right is the main access to the EUT volume. The cell is shown here with its main access door open. The cell provides the core of a totally integrated system which will deliver a complete, PC controlled Emissions and Immunity test package. 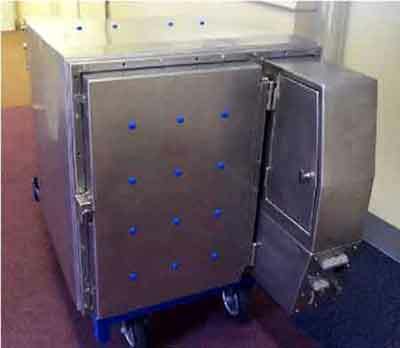 The cell is a stainless steel fabrication with continuously welded joints all round, giving a totally screened enclosure which is completely maintenance free and will not degrade with time. 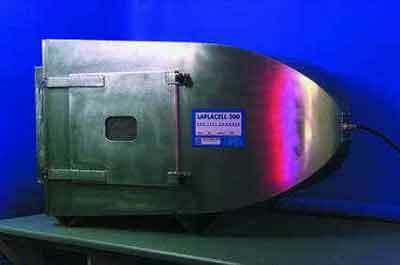 The main body of the cell is made from 18swg sheet giving a very strong unit but with an overall weight of only 100kg. 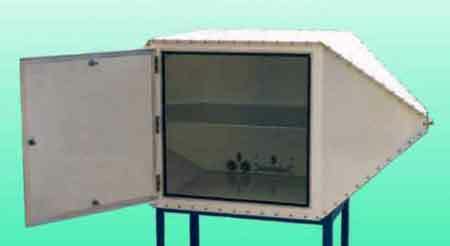 The EUT usable area is contained within a Polypropylene enclosure. All calibration & correction factor data for Emissions & Immunity provided to you. 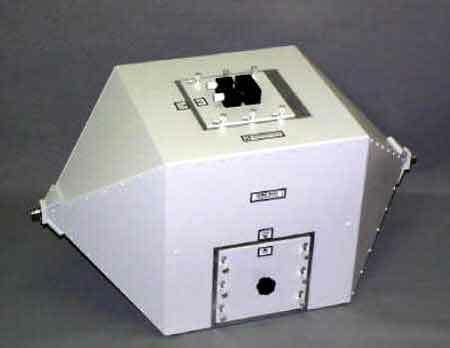 EUT Size: 11.8" x 11.8" x 11.8"
Usable EUT Test Volume: 20.0" x 18.9" x 16.1"
Rear view of an LC300/2 showing the main door for access to the EUT volume. On the right is the access for the filter block terminations. LC300/2, view showing the typical layout of an LC300/2 filter block output. Cables from the EUT in the volume of the cell are terminated here. 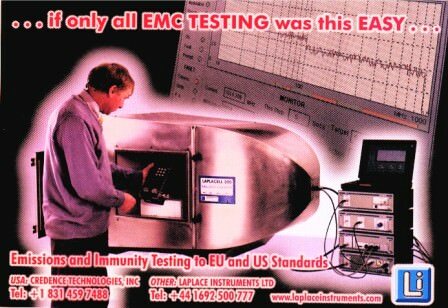 IEC61000-4-3 sets the requirements for RF immunity testing. It specifies fields of up to 10V/m over the range 80MHz to 1GHz and provides minimum performance requirements. The LaplaCell range fully meets these requirements and when used in conjunction with the Laplace synthesizer and power amplifier, provides a complete integrated solution . EN, FCC, As/NZ, and CISPR standards all require the use of an OATS (Open Area Test Site) for the measurement of emissions. This is a demanding requirement in terms of space, resources, calibration and expertise. The LaplaCell range provides an ideal alternative solution, delivering equivalent OATS performance without OATS problems. Uniformity: The balanced septum design ensures good uniformity, even when compared with the "industry standard" GTEM type. The above views make this obvious. 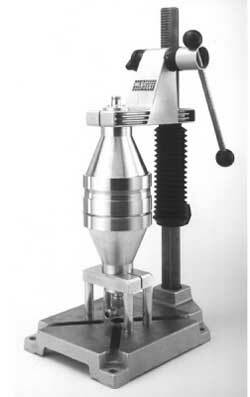 Impedance: The aim of a test cell is to emulate an OATS test. Free space impedance as applies to OATS sites is 377 ohm. 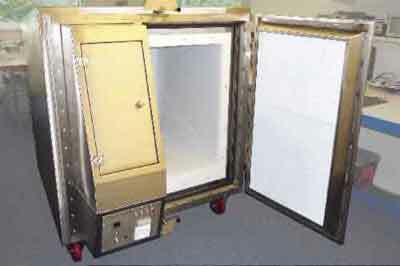 Conventional test cells are 50 ohm systems. The unique design of the LaplaCell matches the incoming 50 ohm impedance to around 200 ohm inside the cell, a much closer match to free space impedance.